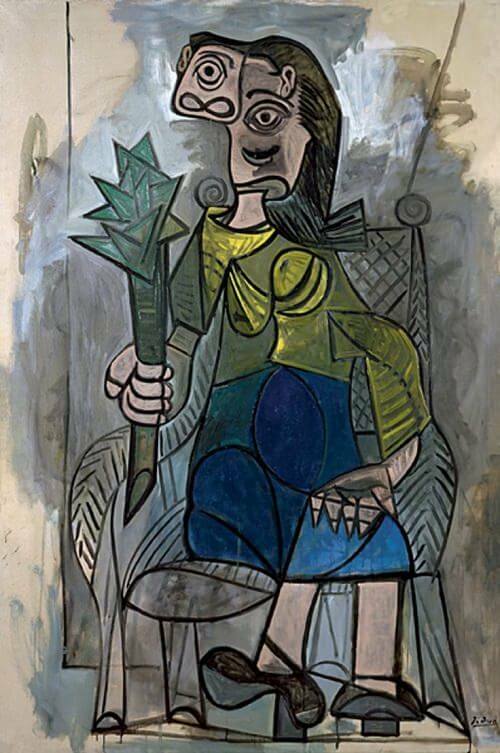 Amid the war years Picasso, occasionally at least, deserted the endeavor to catch similarities and focused all the more on his subjects' mental state. In early 1941 he left on a progression of unacknowledged female figures, and Woman with Artichoke is one in that series. The woman, seated in a basketwork or metal rocker before an uncertain background, is holding an large size of artichoke in her hand. Painted during the turmoil of war, she is symbolic of fear and dread in two respects: in the first place, she speaks to the "broken, soulless, endlessly tormented individual that has relinquished its outward shape and balance on the planet in which it is forced to live"; and, also, she herself turns into "the aggressive animal that holds its warlike actualize, an immense artichoke which might likewise be deciphered as the morning star, in one hand, while the other hand, clawlike, distractedly rests on its knee." The artichoke stops to be a straightforward vegetable and turns into an instrument of torment. In such a setting, the smeared light black foundation can promptly be translated as rising billows of smoke. Picasso outlines the rationally bothered figure with firm, dull diagrams and eviscerates it with the support of inside drawing which unorganically uproots each one piece of the body against an alternate. The elaborate propensity to multivisuality is most clear in the lady's face. Facial multivisuality, as grew here, turned into one of Picasso's most vital aesthetic gadgets as ahead of schedule as 1939. The figure, which is reminiscent of a Byzantine Madonna, makes toward the back, glorious impression. Moreover, "the artichoke helps one to remember the palm leaf usually held in their grasp by saints in ahead of schedule Byzantine sketches." Lady with Artichoke is a wartime picture whose unpredictability triggers numerous affiliations. It makes a threatening and, in the meantime, admonishing effect.